Farmers and farmland owners often cite urban pressure as a key driver of farmland prices in areas surrounding metropolitan centers. While the influence of urban areas on farmland markets is widely recognized, it is difficult for economists to quantify the extent to which urban centers drive farmland prices. New research offers one potential measure based on observed farmland transactions. There are a number of reasons why farmland values are higher near urban areas. Many cities initially grew among particularly fertile soils, and farmland in those areas tends to be quite productive. Farms near urban centers also typically produce high-value commodities. In addition, farms near urban areas have lower transportation costs which reduces the costs of securing inputs and marketing farm goods. Farms near population centers also offer recreational opportunities and lifestyle amenities for urban residents. However, the greatest pressure stems from the potential to develop farmland to high-value land use activities, such as commercial or residential uses. The expected future returns therefore “bid up” farmland prices near cities. While the influence of urban areas on farmland markets is acknowledged, it is difficult to identify the reach of urban influence. More precisely, it can be difficult to classify farmland submarkets by their degree of urban pressure or define farmland markets that are strictly “rural.” U.S. federal agencies, for example, rely on more than two dozen definitions of “rural” areas. A new study uses observed farmland sales data to measure the extent of the urban fringe and to identify “rural” and “urban-influenced” farmland submarkets. The basis for the study is the hedonic price model. The hedonic price model is a popular tool in applied economics in which economists decompose the observed market price of a good into the contribution of each of its characteristics. For example, a farmland parcel can be described by a set of its characteristics including soil quality, transportation access, improvements, and distance to neighboring towns and cities. Each of these characteristics are valued in different amounts and the collective value of these characteristics form the observed market price of the parcel. We expect that in rural submarkets, farmland would be valued primarily by the characteristics associated with agricultural profitability, such as soil quality. However, in urban-fringe submarkets characteristics associated with development or recreational potential, such as population growth or recreational amenities would have a larger impact on farmland’s market value. 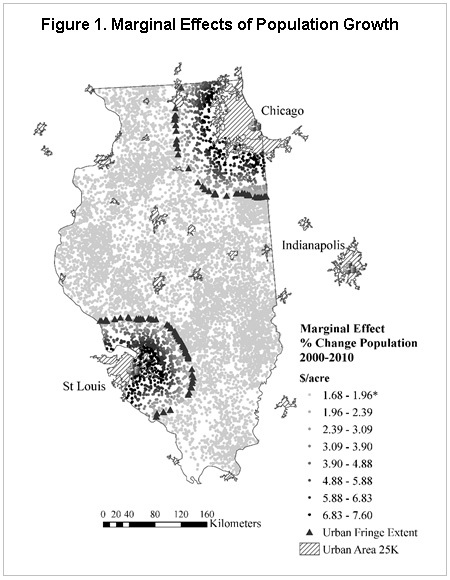 The new study by Delbecq, Kuethe, and Borchers (2014) estimated a hedonic price model for Illinois farmland that allowed the estimated contributions of a land parcel’s characteristics to vary by distance from major metropolitan areas (Chicago, St. Louis, and Indianapolis). The model then searched for structural breaks in the contributions of characteristics associated with either urban or rural submarkets. By examining data from over 10,000 transactions between 2001 and 2009, the study suggested that the large urban centers influence farmland prices as far as 33 miles beyond their boundary. As expected, the study found that parcel characteristics such as land quality had a statistically significant effect on market values in both the rural and urban submarket. However, as illustrated by the map below, the estimated marginal price impact of percent change in population from 2000-2010 was found to be different in the two submarkets. The share of farmland price associated with population growth is greatest near urban boundaries and declines as one moves away from the major metropolitan areas. In the rural submarket, the estimated price premium for population growth is statistically indistinguishable from zero. The model’s estimated extent of the urban fringe is depicted by the dark triangles. The views expressed are those of the authors and should not be attributed to ERS or USDA. Cromartie, J. and S. Bucholtz (2008). "Defining the 'Rural' in Rural America." Amber Waves 6 (3): 28-34. Delbecq, B.A., T.H. Kuethe, A.M. Borchers (2014). "Identifying the Extent of the Urban Fringe and Its Impact on Agricultural Land Values." Land Economics 90 (4): 587-600.